Small gardens, balconies and patios can welcome wildlife just as large garden spaces filled with shrubs and sources of water. 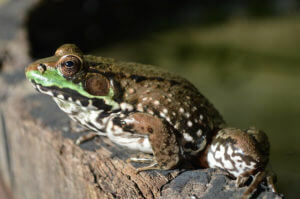 Building a pond is one of the best ways to attract wildlife. Small spaces need not excluded from having a pond or water feature. 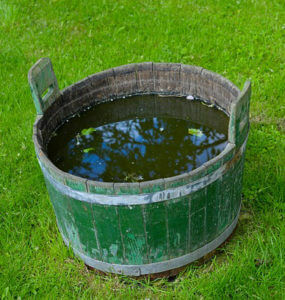 A large non-porous planter or an old barrel are ideal for making the perfect pond to add to small spaces. According to Monty Don, ” the container you use to make a pond should have a neck wider than 45cm and a depth greater than 40cm”. The minimum depth is a required feature in order to add aquatic plants. If you are lucky enough to find an old half barrel the age of the wood is likely to mean it won’t be sufficiently waterproof. The solution is to line with a pond liner – either a PVC liner or rubber pond liner. When filling a half wooden barrel with aquatic plants, spend some thought on the type of wildlife it is likely to attract. Birds, for instance will appreciate a boulder or brand to perch on when drinking. Once the liner is in place, cover the bottom of the barrel with a layer of aquatic compost. Then add a fine layer of grit above that. Aquatic plants can be planted directly into the layer of compost or you can plant in an aquatic basket. With the average garden in the U.K. getting smaller and smaller, landscapers and environmentalists and researching different approaches to fill any amount of outdoor space with wildlife friendly plants and water features. This entry was posted on June 19, 2018, in Garden ponds. Bookmark the permalink.